Population geneticists at Bielefeld University and the British Antarctic Survey have found that eleven seal species only narrowly escaped extinction. Their study has been published today in Nature Communications. Their fur was used as a raw material for coats; their fat was used for oil lamps and cosmetics: right up to the end of the nineteenth century, millions of seals were being hunted and killed every year worldwide. The consequences of this episode of commercial hunting for today's seal populations is the subject of a study published today in Nature Communications. Population geneticists at Bielefeld University and the British Antarctic Survey have found that eleven seal species only narrowly escaped extinction. The scientists managed to include nearly all of the species alive today in their research. The study nevertheless reveals that most species survived the heyday of seal hunting in sufficient numbers to retain most of their genetic diversity. "Hunting, epidemics, and climate change all have the potential to reduce the number of individuals in a population to the point where genetic diversity is lost," says Professor Dr. Joseph Hoffman, head of the Molecular Behavioural Ecology research group at Bielefeld University and sub-project manager in the Transregio Collaborative Research Centre NC³ that is studying animals and their individual niches. "These extreme population reductions are known as bottlenecks and can affect a species' potential to survive." "When a species lacks genetic diversity, it has a lower chance of adapting to changing environmental conditions or protecting itself against parasites or pathogens. You can compare the gene pool with a toolbox: the fewer tools you have, the less well-equipped you are for different situations," says Hoffman. The researchers analysed which seal species passed through bottlenecks due to overhunting. They carried out this research in cooperation with colleagues in ten different countries. "This enabled us to collect genetic data on thousands of seals from 30 different species," says Martin Stoffel, the lead author of the study and a doctoral student in Joseph Hoffman's research group. As there are 33 different seal species alive today, this makes the study the most comprehensive work on the genetic diversity of seals. For example, it even used data from a study of the Antarctic fur seal that lives on Bird Island (South Georgia) in the Sub Antarctic. This research on fur seals is part of the work at the Transregio Collaborative Research Centre NC³. The result: seal hunting around a century ago led to the near extinction of almost one-third of the species studied. "Most species have recovered and are still genetically quite diverse despite strong population declines' says Martin Stoffel. "However, there are four exceptions: the northern elephant seal, the Mediterranean monk seal, the Hawaiian monk seal, and the Saimaa ringed seal," says Stoffel. "The genetic material of individual animals within these species is very similar. These four species only have up to 20 per cent of the genetic diversity of those species that have been hardly or not hunted at all. In the northern elephant seal, for example, only few dozen individuals survived hunting to rebuild the current population of over 200,000 animals." Stoffel is an expert on the northern elephant seal. To study them for his dissertation, he went on an expedition to the Islas San Benito, an uninhabited group of islands off the Mexican Pacific coast. Which factors explain why certain species suffered more from being hunted than others? The study confirms that "species that bear their young on land declined much more strongly as a result of excessive hunting than species that give birth on ice," says Stoffel. "This is probably because those giving birth on ice tend to live in remote Arctic and Antarctic areas where they were out of reach of hunters." Population bottlenecks can also be found in those species where a single male defends a harem of several dozen females during the breeding season. 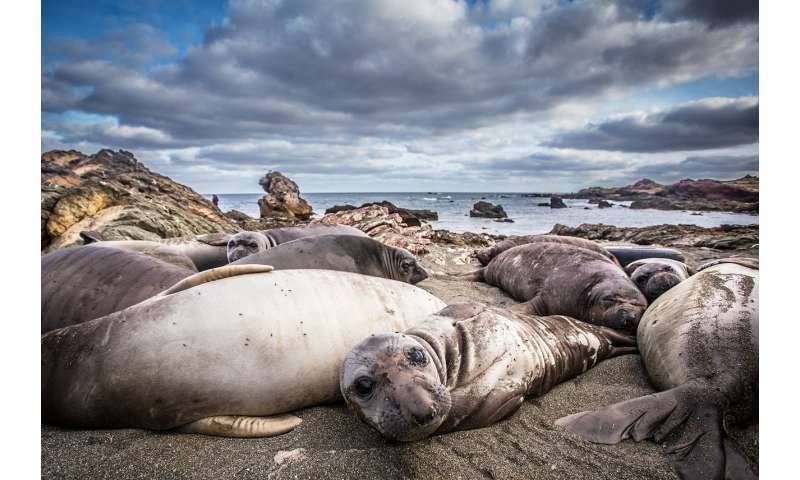 "This is the case with the northern elephant seal and the southern elephant seal just as much as the Antarctic fur seal," says Stoffel. "Their mating systems result in dense aggregations of breeding animals, making them easier for hunters to kill." Whereas at the end of the 19th century, millions of seals were still being killed by hunters, the German animal protection society (Tierschutzbund) reports that nowadays, 750,000 seals are killed each year for commercial purposes. Most of these seals are now being hunted in Canada, Greenland, and Namibia.